It was a bright Sunday morning and with a cancelled trip with Mike due to work commitments i had bounced around with several rivers in mind to fish. It was a toss up between something potentially big and possibly blank or lots of little fish which should hold big fish but i hadn't fished enough there. Reaching the river there wasn't much signs of life so i set up with a searching pattern with my nymphs under a klinkhammer, this especially helps as the bottom is 100% snag city. After running it through the first 15 metres and signs of nothing i popped on a streamer and had 4 chases but only one touch. Continuing on i switched back to the klinkhammer set up, using my slate colored nymph, and was greeted by the wake of a rise. I sat and watched for a short while to see if it was a rise of a leaf and sure enough another rise came up. As i crept up almost on my knees i could see 2 trout looking towards and inlet. The rising fish had been in the top of the main pool and i know a big fish lives here. Based on the size of fish i have had on this river i would say it was easily 4 as it dwarfed the 3lbers. I flicked the nymph using a bow and arrow cast to cause minimal rod flash and let it drift downstream, the klinkhammer slipped under and i struck into it. It was a nice fish. I fought hard to keep the fish in the pool, i know there are multiple snags everywhere so you have to keep the fish in a neutral position. They don't get this big without knowing all the escape routes. After a couple of minutes i eventually got it to netting distance only for my net to snag on the bottom. Thankfully it was a quick snag and i quickly netted it on the second attempt. 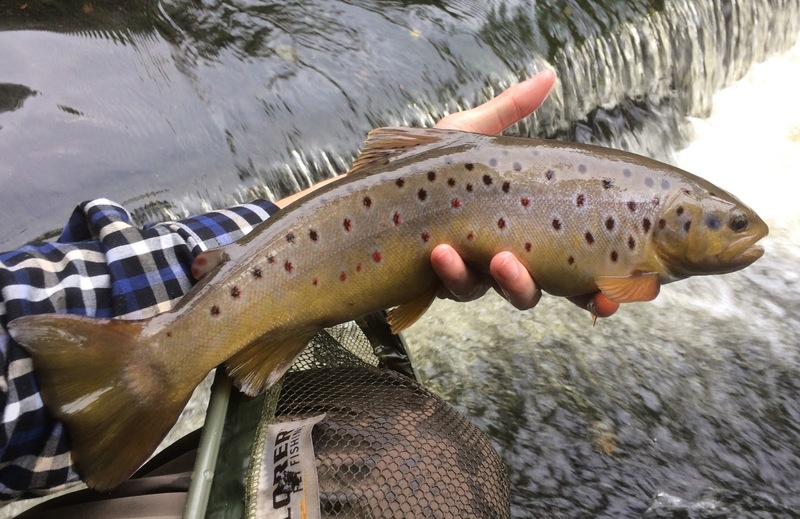 It was a very fat trout, the fattest i have had all year, i struggled to support it on my hand in my signature pose before it slipped off and into the river it went. Luckily i managed a quick picture. Moving on up i stalked 2 large chub in a couple of inches of water under a branch. A perfect bow and arrow flick under the branch and i saw the first chub open its mouth for the nymph, i struck just as the second went for the klinkhammer and i missed them both! That would of been a very interesting double hook up! With fish rising i checked the water to see what they were eating, these big sedge like flies, easily an inch in size. I could see a couple of rises and i cast upstream towards them, a large trout came up off the bottom and sipped the fly, i struck but it had already rejected it! Removing the nymph from underneath incase that was the reason it rejected it, a large trout swam downstream next to me. It was easily a couple of pound and it sat under my rod tip, the white of its mouth opening as it ate nymphs. i stood still for 15 minutes watching it, trying not to spook it, it even took a dry off the top right next to my rod tip before eventually swimming back upstream. I tested my knots as i prepared to cast and on the first cast it took it. It shot off like a steam train and the 5# rod was no match, it bent right over and flattened out putting the full strain on the line. 11 seconds on the camera it took for it to snap me off. 11 seconds of adrenaline. 11 seconds of pain. The fish went quiet after that, there had been alot of commotion in the water and with visibility near perfect they were very aware of my presence now. So i headed upstream. Things went very quiet for a while, maybe an hour or 2 before i spotted a fish. Nothing showing on both nymphs and streamers in between. This was another decent fish, i had seen a small swirl and crept up on it, keeping as close to the centre line behind it to avoid it seeing me in the corner of its eye i still lowered my profile right down and bow and arrow cast it, probably 15 feet. It took it straight away and it launched itself a couple of feet out of the water, this was another good fish and it was trying all the tricks in the book. One thing i didn't account for was the new snag in the river, a large piece of cling film like material about 20 foot long lay on the river bed. It snagged up in there and i waded up on it. The fish was still full of fight and was only restricted by the snag. Stupidly i thought that giving the fish a chance to fight would feel better to me especially being the last day of the season, so i untangled it from the snag rather than netting it. It slipped the hook and buggered off. It took me a minute or so to really realise what had happened as i was still to busy removing the snag. I felt a little stupid. 3 more fish were caught in similar fashion, smaller than the previous ones but beautiful fish none the less. It felt good that despite being 6ft 8 i had proven all day how stealthy i could be, i'm like a hairy heron! It was a good day to finish the season, though i could of had bigger fish, it was still a fun and well earned day.